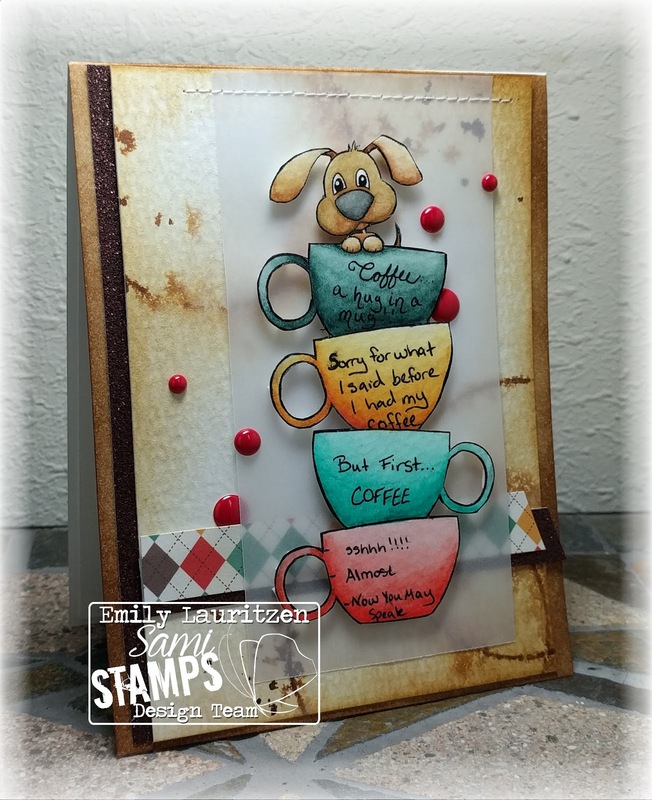 So with the slow groggy mornings brought inspiration to put together a few cards using a super cute image from the most recent Sami Stamps release - Fuzzy Cup Friends. I used the Cup Pup image and went to town! For this card, I started by taking a jar that was sitting on my desk and inking up the rim to use as a circle stamp to try and mimic coffee rings on my watercolor paper. I'm not sure it fully worked the way I wanted, but it looks pretty cool in the background. I did some splattering and inked up the edges as well so it wasn't a stark white background. Since the cups are normally all blank, I decided to do a little doodling on them with the pencils, a white gel pen, and some glittery pens as well. I think the added detail really helps finish off the image. Then I simply layered the image onto some glitter cardstock and vellum and mounted it onto my dry card base. I stamped the Enjoy sentiment from the Simon Say Stamp and Winnie & Walter collaboration set Big Bloom and adhered that on the edge of the image. 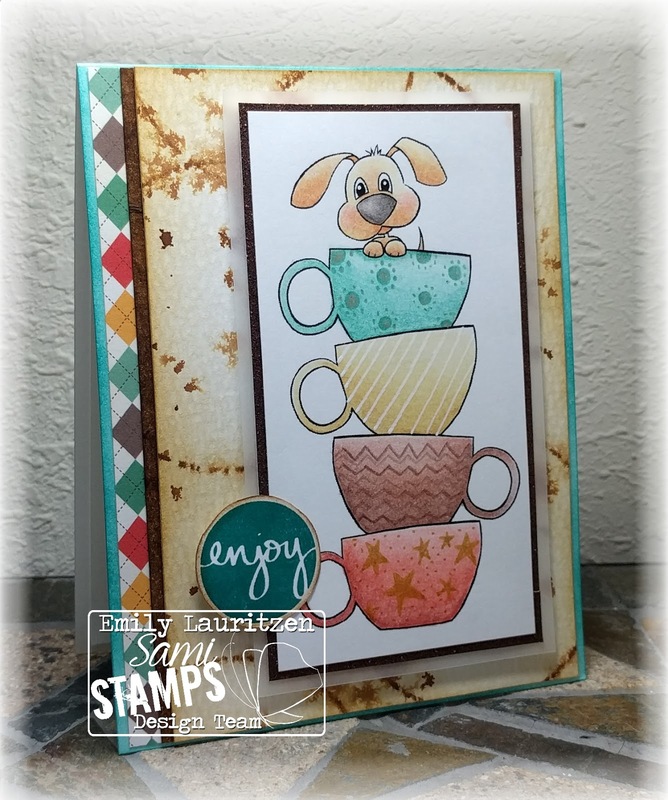 My colors for the cups were pulled from Lawn Fawn's Sweater Weather paper pack, so I added a thin strip of that to the side as well, and that finished this card! I did make another card with this image that I'll briefly describe. Since there are so many words on the front of this card, I added the sentiment to the inside so it wouldn't clutter the front too much. Super cute cards that I loved making! 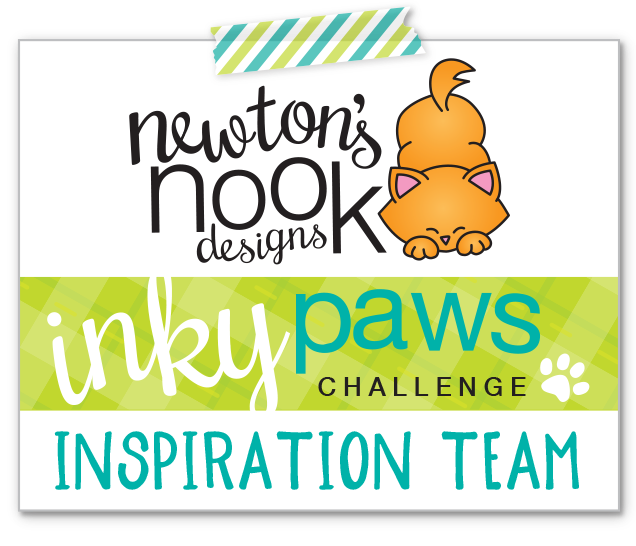 Be sure to stop by Sami Stamps, we have an Add Sparkle challenge running this month! 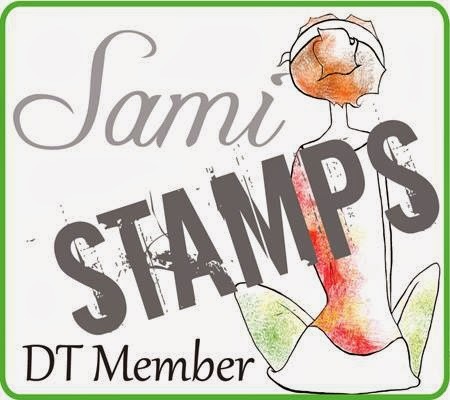 Just remember to use a Sami Stamps image and join in!! Hi Emily!!! I love your cute card!!! 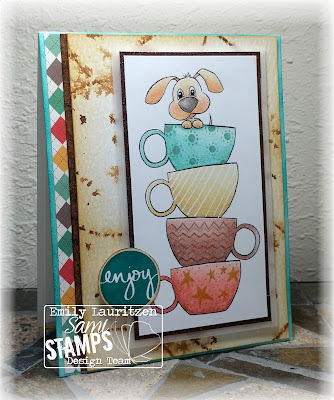 I love the way you've switched up the sketch at Try Stampin on Tuesday and the way you've used the stacked cups. Fantastic idea - and really, what isn't made better by a cup of coffee! What a creative interpretation of the sketch! Way to go! Very cute! These cards are too cute, Emily! I'm not a coffee drinker myself, but always enjoy the funny jokes I read about needing coffee. :) Love that you flipped the sketch on its side and that you wrote your funny sayings yourself...they look great to me! Thanks for sharing with us at Try Stampin' on Tuesday. Super cute card and design! Adorable pup! Thanks so much for sharing with us at Word Art Wednesday! Oh my goodness - this is super cute! Great take on our sketch, too. Thanks so much for sharing with us at Try Stampin' On Tuesday!